Bao Witoon, head Muay Thai trainer at Poonsawat Camp, quickly jumps into a traditional fighting stance. Witoon has been boxing since he was 8 years old. It is a discipline that has been passed down his family for generations. Witoon opened Poonsawat 10 years ago and is happy to see it continually grow. He trains people from all types of backgrounds completely free of charge. His love of the sport as well as seeing others healthy and drug free is motivation enough for operating Poonsawat Camp this way. These hanging tires and “Thai” bag are used for the most common Muay Thai exercises. They are particularly great for practicing punches, kicks, knees and elbows. The benefits of bag training include improved movement and timing coordination. In addition, it gives the trainee a realistic feeling similar to fighting an actual opponent—a significant type of work out key to winning actual fights. Several young adult fighters train Muay Thai outside the front yard of Poonsawat Camp. The fighters use several different items to simulate real life combat. Bag work is used most often to perfect timing and form good habits and techniques for sparring. 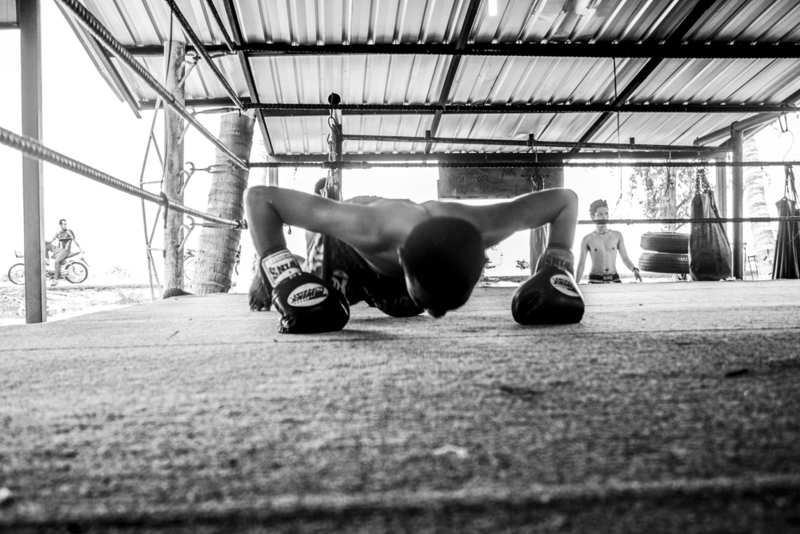 A young adult fighter does pushups inside of Poonsawat Camp’s boxing ring. The fighter just completed his first fighting round of the day against a fellow trainee who is also doing pushups off to the side before beginning round two. Two young fighters box inside of Poonsawat Camp’s ring while Bao Witoon, leader of the camp, provides advice and criticism. Pet Panya (left), champion fighter of the Kon Khon Posuwan tournament, and another young boxer (right) struggle to beat one another in Poonsawat Camp’s fighting ring. Bao Witoon, leader of the camp, is hoping to send Panya to train in Bangkok with the famous Muay Thai fighter Khaosai Galaxy, a past teacher of his as well. Witoon says he has high hopes for Panya and that many who train in Bangkok go very far with their Muay Thai careers. A young adult fighter at Poonsawat Camp takes a quick water break after heavily conditioning his shins through a process called cortical remodeling (this is done by repeatedly kicking a dense bag, thus hardening the bone). He stands and watches two fellow trainees duke it out in the ring. For Muay Thai, it is important to not only train oneself physically, but mentally as well. Each fighter has a unique style that must be approached appropriately. A pair of TWINS boxing gloves lying in the middle of Poonsawat Camp’s boxing ring. Fighters began wearing gloves in competition and training around the year 1956, when Lumpinee Boxing Stadium first opened in Bangkok. Before gloves, fighters used traditional rope-binding (Kaad Chuek) which made the hands a hardened and dangerous striking tool. After the occurrence of a death in the ring, it was decided that all fighters should wear gloves and cotton coverlets over the feet and ankles. A young fighter poses between the ropes of the fighting ring at Poonsawat Camp. Several of the fighters are below the age of ten, which is of no problem to Bao Witoon, head trainer of the camp, especially because he enjoys seeing people take an early interest in the sport and reap the benefits that come with community and constant exercise. Fish Sumgifle, a young trainee at Poonsawat Camp, patiently waits beside the ring as other boxers fight. Fish comes from a poverty-stricken family in the same neighborhood as the camp, he comes here to train every day except Sunday in order to live a healthy life style and to stay away from drugs such as amphetamines, which are easily available in the area. A group of young children play inside the boxing ring at Poonsawat Camp. On most days the camp doubles as a day care for those that have no place else to go. Muay Thai training begins at 4 P.M. (after school), though the children are welcome to stay and practice or remain in the area. A few of the trophies that stand in Bao Witoon’s home. Witoon, leader of Poonsawat Camp, lives directly behind the fighting ring of the camp. The trophy in the middle belongs to one of his students, Pet Panya. It was awarded to him after working his way to the top out of 1,000 other fighters at the Kon Khon Posuwan tournament. Narong Komsaman, lead Muay Thai trainer at Camp Sitawee, poses between two punching bags inside of his camp. Komsaman began boxing at the age of 17 and is now 73 years old. He has run Camp Sitawee for the past 30 years and is more concerned with teaching the history and culture attached to Muay Thai rather than training students for competitions alone. 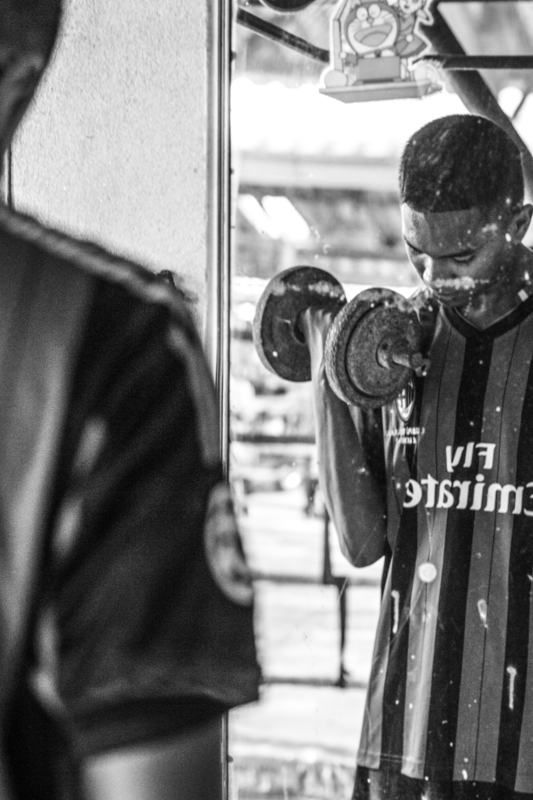 Parinya Nuannamjit, a 16 year old student at Camp Sitawee, performs bicep curls in front of a mirror near the entrance of the camp. Nuannamjit has been training at Sitawee for about two months, he goes there every Saturday and Sunday from roughly 4-6 p.m.
Parinya Nuannamjit prays inside the ring at Camp Sitawee before shadow boxing. It’s very common for Muay Thai practitioners to pray before training in order to imbue feelings of strength and power. Parinya Nuannamjit (left) and Narong Komsaman (right) practice fighting in the ring at Camp Sitawee. They are currently training proper posture and form for a number of kicking techniques, including straight kicks (te trong), diagonal kicks (te chiang), and foot jabs (thip). A muay thai boxer (right) and a female worker (left) chat outside of the ring before starting the match. A Muay Thai boxer uses a special technique to stretch his legs before beginning round two of the fight. In the summer of 2014, I traveled to Thailand in order to craft a narrative on Muay Thai, a form of fighting developed in the country several centuries ago. 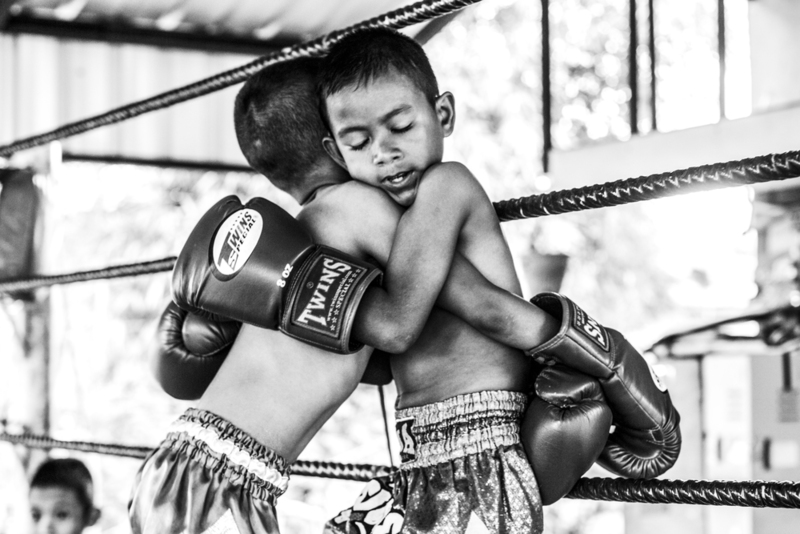 This narrative is a collection of photographs that reflect Muay Thai, a martial art form that descended over a millennium ago from the Kingdom of Thailand. Muay Thai is unique because it slowly transforms the body into one all-powerful machine. Practitioners train their bones to withstand massive amounts of stress through diverse processes, specifically cortical remodeling. This process calls for the repeated striking of stiff objects, which eventually leads to reforms in bone mass and increased density in areas of stress. The body then converts into a caricature of the most savage weapons of war. Shins and forearms are precisely hardened to act as an armor in order protect oneself. Hands act as the blade and saber. The elbow becomes a vicious staff. The legs and knees mutate into a menacing hatchet. Every part of the body is used to its full extent. These eight distinct points of contact are why Muay Thai is notably alluded to as “The Art of Eight Limbs.” The popularity of this combat sport has grown immensely in the past century. Modernization of Muay Thai by King Rama VII (r. 1925-35) revolutionized the sport by systemizing rules and regulations. In 1995, the World Muay Thai Federation was founded and later established in Bangkok. There are now thousands of gyms spread all over the globe. Poonsawat Camp is led by Bao Witoon, a passionate boxer who trains anyone interested in the sport completely free of charge. He has run the camp this way for the past 10 years and believes that seeing his students healthy and drug free is payment enough. Witoon trains fighters to a certain skill level before sending them off to train with professionals in Bangkok. Camp Sitawee, on the other hand, is led by Narong Komsaman, an elderly boxer who has actively engaged in the sport for over 50 years. Students pay between 500-1000 baht (16-32 USD) per month to train with Komsaman, who has run Camp Sitawee for the past 30 years. Unlike Witoon, Komsaman teaches Muay Thai primarily for the history and culture of Thailand. These photographs are presented in an order which I deemed most appropriately fit.